FORT GORDON, Ga. — When Paige Pierce tossed in her final putt after four rounds at the 2017 PDGA Professional Disc Golf World Championships, she could finally breathe a sigh of relief, as she had successfully secured the fourth world title of her career and held off a hard charge from defending world champion Valarie Jenkins. Even though the breath was certainly most welcome, Pierce said it’s those high-tension rounds and moments that push her to play her best, especially when the sport’s most prestigious title is on the line. Indeed, Pierce needed every stroke down the stretch, as it took nearly the entire final round to keep Jenkins at bay. Pierce’s even-par 66 Saturday brought her winning total to a 7-under par 259 and was enough to finish five strokes ahead of Jenkins, whose final round 1-under par 65 score took her total to a 2-under par 264. Lisa Fajkus finished in third place after her 4-under par 62 resulted in a 4-over par 270 total, four strokes ahead of Catrina Allen’s 8-over par 274. 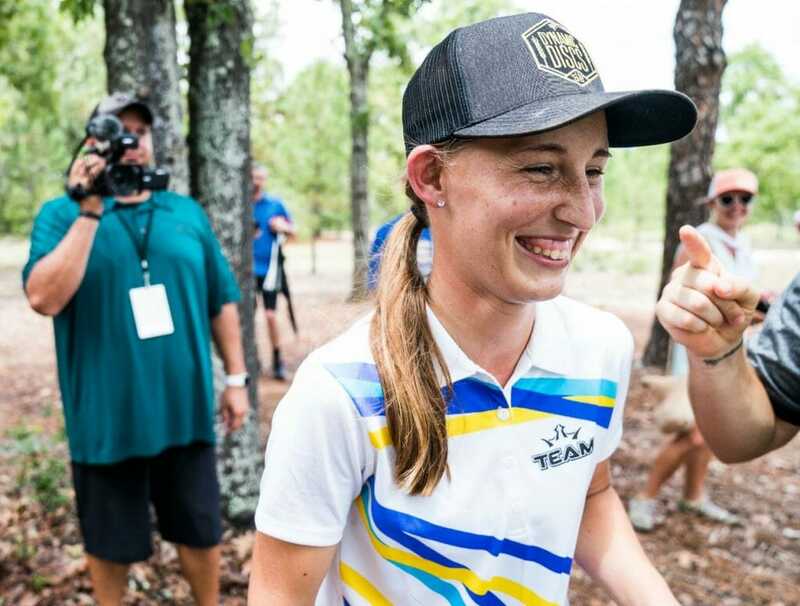 In only her third time competing at Pro Worlds, Fajkus collected the best PDGA Major finish of her career, and her fourth round 62 was rated at 1015, making it the highest rated round in the division through the event. Additionally, it was the highest rated round of her career and first over 1000. Pierce took home $5,500 for her performance, while Jenkins and Fajkus pocketed $2,500 and $2,000, respectively. Pierce held a six-stroke lead over Jenkins heading into the final, but the margin narrowed after just the first hole, where Pierce bogeyed and Jenkins parred. After matching pars on hole 2, Pierce’s second shot on hole 3 went OB as she tried to bite off extra distance on the massive, 1,067-foot par 5 to go for the birdie. Her hyzer up and over the trees got left too quickly, leaving her with only the option of playing for bogey. Jenkins cleanly navigated the fairway to pick up another stroke, moving the gap to just four. After matching scores on holes 4 and 5, Jenkins’ drive over the valley on hole 6 landed mere feet from the pin, while Pierce’s tee shot got caught up early by a guardian tree. It fell close to a split rail fence, and Pierce, forced to take a straddle stance due to the tricky lie, missed the birdie putt. One third of the way through the course her lead had been cut in half. Pierce got the stroke back a few holes later, though, by taking a birdie on the par 5, 1,060-foot hole 9. A brief, but intense burst of rain began on hole 11 as the leaders took to the technical back nine, where Jenkins regained another stroke. With the margin down to three, Jenkins grabbed yet another stroke with a long uphill birdie putt on hole 14’s dangerous green. With the difference down to just two with four holes to play, things took a turn on 15. With Pierce in position for a par after the long, densely wooded fairway, Jenkins just had to get up to the green from roughly 80 feet out to get a putt for par. Her upshot hit a tree, though, and kicked to 25 feet from the pin. “I was pretty close, within two,” Jenkins said. “I had kind of a weird grip on my putter, shanked the upshot, but I should’ve made the putt anyway.” Indeed, her par putt was just high and ricocheted off the top of the basket. The lost stroke gave Pierce a three-shot lead with three to play. Drives from Pierce and Jenkins both came up short of the mounded green that is the most difficult feature of hole 16. Jenkins’ attempted layup caught a limb and left her with a 35-foot par saving putt. Pierce laid up for par inside 10 feet, leaving Jenkins to spin a low-ceiling bid to have a chance on the final two holes. Her attempt was just wide left, and her comeback low into the cage. Jenkins was resolute from the start that she would have to be the one to challenge Pierce, and how challenging it can be for someone to play with a lead down the stretch. Pierce was surrounded by family and friends when she made her final putt, and later at the awards ceremony was sure to thank her supporters, who filled three full rows of the auditorium. In addition to the support of her family, Pierce acknowledged the encouragement she feels from transitioning to Dynamic Discs in 2017. Pierce wasn’t the only one making a big statement at this event while transitioning to new plastic. Jenkins, who moved to Discraft in January, said there was a noticeable difference in her mental state this week as she played under a new team banner. While the run for first place was the most compelling, the battle for third between Fajkus and Allen had its fair share of tense moments throughout the final round. Fajkus began the round four strokes behind Allen, and lost one right off the bat by bogeying hole 1. She parked hole 2 to right the ship, but found trouble again shortly thereafter on both holes 3 and 4. After parring hole 5 Fajkus was still six strokes behind Allen. The Texas pro knew hole 6 could be a turning point, though, and that’s where her “birdie train,” as she called it, picked up steam, starting with a tee shot that was mere inches from an ace. The confidence to aim straight for the basket carried over for the next four holes, she said. That streak shifted the momentum in Fajkus’ direction as Allen began to scuffle off the tee. Her drive on hole 8 went right into the thick rough, but she managed to save a par. Allen’s tee shot hole 9 went out-of-bounds over the sidewalk the runs the length of the left side fairway, though, and she carded a bogey 6. 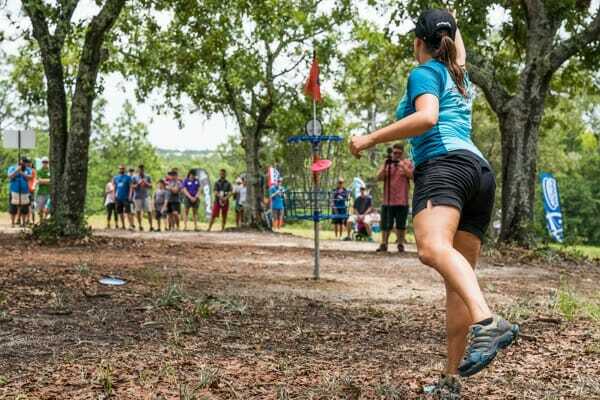 Fajkus landed one of the few birdies carded in the Open Women’s division on the 1,060-foot hole with a jump putt from 45 feet, and she enthusiastically ran in to the basket to collect her trusty KC Pro Aviar having leapfrogged Allen for third. Fajkus carried the strong play to the back nine, where she collected four more birdies. The run was highlighted by a death putt make from 35 feet on the challenging hole 14 green, one that slopes away from the basket at a steep angle toward an out-of-bounds swamp. The comeback put her four strokes clear of Allen, and Fajkus, a longtime regional pro who is only in her second year of full-time touring outside of Texas, said the result was something she would carry with her. Fajkus’ performance was not lost on Pierce, who was more than impressed by her fellow Lone Star State native’s showing. Hannah Leatherman jumped from an eighth place tie and into fifth place with a strong final round at Fort Gordon, while Sarah Hokom, Jessica Weese, and Ragna Bygde Lewis all tied for sixth. Melody Waibel finished in ninth place, while five-time world champion Elaine King rounded out the top 10. Pierce’s fourth title tied her with Jenkins and put her ahead of Texas disc golf legend Des Reading in the career win column. Now just one shy of King and Juliana Korver’s record five world championships, Pierce said she would love to join that elite company. 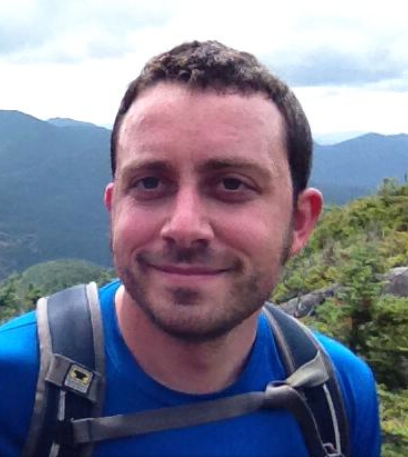 Comments on "Pierce Holds On For Fourth Career PDGA World Title"